Experience Endocrine Society educational programming from the convenience of your home or office. The Endocrine Society session recordings are a compilation of digital audio recordings and synchronized slides accessible on your computer, tablet or phone, or on the go with downloadable mp3. NEW! Purchase CEU session recordings on the following topics: adrenal, calcium and bone, diabetes, obesity/lipids/cardiovascular, pituitary, reproductive health, and thyroid. 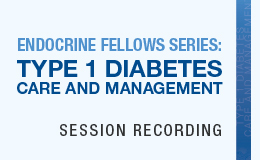 Additional information on purchasing and accessing the session recordings can be found at http://sessions.endocrine.org. If you are looking to purchase conference session recordings, they can be found in the Conference Sessions section in our online store.